Organic farming has experienced something of a boom in recent decades, fuelled by consumer demand for healthier and safer food products as well as more environmentally friendly farming methods. Global sales of organic certified food and drink grew by 10 percent in 2015, harvesting an estimated 81.6 billion US dollars, according to a recent report from the Research Institute for Organic Agriculture (FiBL). To be certified and sold as ‘organic’, produce must be farmed in accordance with strict regulations, governing a wide range of issues from pesticide use through to genetic modification. In the European Union, for example, organic fruit and vegetables must meet EC Council Regulation No 834/2007, while the U.S. Department of Agriculture’s National Organic Program administers and enforces its own set of essentially equivalent rules. One regulation common to several national certification schemes concerns the use of fertilizers and soil conditioners for crop production. To create a more sustainable, closed system, synthetic nitrogen fertilizers (such as potash and ammonia) are not permitted. Instead, only natural fertilizers, such as peat and animal manure, can be used. Some fertilizers and soil conditioners are also subject to additional rules, such as the requirement that wood must not be chemically treated after felling. But while organic fertilizers are more natural, they’re often less efficient than chemical products, meaning more must be used (and more money must be spent) to achieve the same nutrient uptake in crops. As a result, some producers add conventional chemical fertilizers to their soils to keep costs down, while fraudulently claiming that products are organic. In order to maintain consumer confidence and protect brand reputation, food testing laboratories therefore rely on robust and cost-effective analytical techniques for the identification of mislabelled organic fruit and vegetables. One approach that can be used to distinguish between fruit and vegetables grown in organic and synthetic fertilizer is elemental analysis interfaced with isotope ratio mass spectrometry (EA-IRMS). EA-IRMS can be used to study a crop’s individual nitrogen isotope fingerprint – the subtle differences in the plant’s nitrogen components that can be used to identify the fertilizer used to grow it (1,2). Nitrogen has two stable isotopes: nitrogen-14, which makes up the vast majority (99.6%) of naturally occurring nitrogen, and the heavier isotope nitrogen-15, which is far less common (0.4%). EA-IRMS is able to detect the very small differences in molecular weight between compounds containing these isotopes, and determine the ratio of these isotopes (15N/14N). Nitrogen isotope fingerprints are commonly reported in terms of δ15NAIR, a value that is measured relative to atmospheric nitrogen, which has a relatively constant 15N/14N ratio and therefore a δ15NAIR value of zero. Synthetic nitrogen fertilizers tend to have δ15NAIR values close to zero, as their nitrogen is derived from atmospheric nitrogen. As the nitrogen isotope fingerprint of the crop is directly related to that of the fertilizer used to feed it, fruit and vegetables grown using synthetic fertilizers tend to have nitrogen isotope fingerprints between +3‰ and +6‰. Organic fertilizers, based on plant matter and animal waste, have a broader range of δ15NAIR values which are often much greater than zero. As a result, produce grown using fertilizers such as peat, sewage sludge and animal manure, tend to have nitrogen isotope fingerprints between +8‰ and +20‰. Figure 1 shows δ15NAIR data measured for four tomato samples grown with either organic or synthetic fertilizers, obtained using a Thermo Scientific EA IsoLink isotope ratio mass spectrometer. In each case, approximately 5 mg of dried, homogenized tomato sample was combusted in the presence of oxygen. After reduction, the nitrogen gas produced was analysed using a Thermo Scientific Delta V isotope ratio mass spectrometer. For each data point, four replicate analyses were performed and averaged. 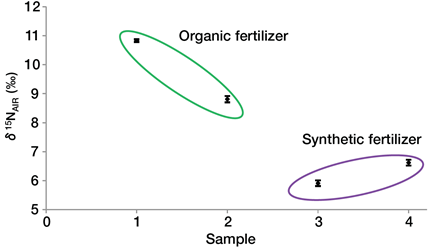 The results show a clear difference between the δ15NAIR values for the two groups, highlighting the strength of the approach for distinguishing between organic and conventional fertilizers. With potentially many hundreds of samples to analyze, high throughput and cost-effective analysis are important criteria for many food testing laboratories. With an analysis time of less than five minutes using 0.4 litres of helium per sample, the fast and resource-efficient approach enables high sample throughput with a low cost per sample. With the mislabelling of organic food products, a significant concern for the industry, laboratories need robust and affordable methods to determine the authenticity of organic grown produce. EA-IRMS enables laboratories to quickly, reliably and cost-effectively perform nitrogen isotope fingerprint analysis of large numbers of samples to safeguard consumer trust and protect brand integrity. (1)	KH Laursen et al. Food Chem. 2013, 141, 2812-2820. (2)	H-L Schmidt et al. Isot. Environ. Health Stud. 2005, 41, 223-228.